At the board meeting on 12 February 2010, it was decided that LECIP would split, moving to a pure holding company structure and establishing the US corporation LECIP INC. as a new subsidiary. The split is planned for October of this year, and the new subsidiary will be established on 1 March. Details regarding this announcement follow. A draft outline of the organizational structure for the new pure holding company is attached as a separate document. LECIP is currently comprised of the Domestic Operations Group (which includes the Domestic Operations Division of LECIP CORPORATION as well as the fully owned subsidiary LECIP ELECTRONICS CORPORATION) and the Overseas Operations Division (which includes the Overseas Operations Division of LECIP CORPORATION as well as the fully owned subsidiaries LECIP U.S.A., INC., THAI LECIP CORPORATION LIMITED, and LECIP (SHANGHAI) CO., LTD.
With the new corporate split, we are planning to combine the entire Domestic Operations Division1 with part of the Overseas Operations Division2 under the newly established LECIP CORPORATION, while shifting the other part of the Overseas Operation Division3 to the newly established LECIP INTERNATIONAL INC.
Includes only LECIP U.S.A., INC., THAI LECIP CORPORATION LIMITED, and LECIP (SHANGHAI) CO., LTD. The remainder of the Overseas Operation Division; does not include those operations transferred to LECIP CORPORATION and those related to LECIP INC. Note: The split and new establishment of LECIP INTERNATIONAL INC. is an incorporation-type company split as stipulated in Article 805 of the Companies Act (simple split), and will therefore be carried out without the approval of LECIP CORPORATION shareholders. 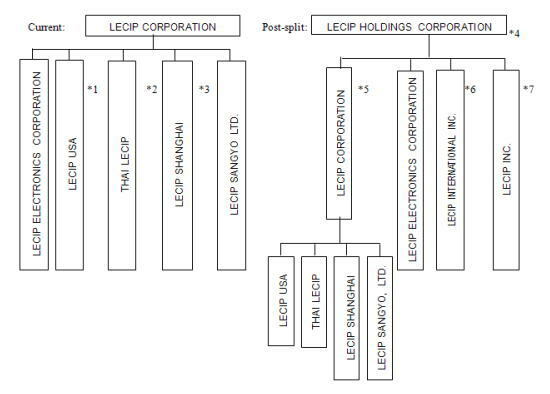 Upon splitting, LECIP CORPORATION will become a pure holding company owning all LECIP Group operational company shares. On the date of the split, the name of the company will be changed to LECIP HOLDINGS CORPORATION. Establishment of the subsidiary (US corporation) LECIP INC.
Restructuring overseas business strategy is of central importance among the current issues facing the LECIP Group, and a critical part of this is breaking into the transport equipment market in North America. We are currently concentrating every available effort into developing key personnel and acquiring new business contacts in order to achieve this, but establishing an organization in North America to specialize in these operations is both essential and more efficient. It is for this reason that we have decided to establish the new US corporation LECIP INC. (headquartered in Illinois) on 1 March 2010. The US consolidated subsidiary LECIP U.S.A., INC. is currently part of the LECIP Group, but sweeping changes have come to the transport equipment market, as well as to the neon transformer market in which LECIP U.S.A., INC. is involved. The establishment of a separate LECIP INC. in the US will address this issue as the new company appoints key personnel knowledgeable in the transport equipment market. Furthermore, LECIP U.S.A., INC. announced on 20 May 2009 that it had ceased the sale of neon transformers in the US and would now focus its efforts on breaking into and offering products for the rail-use fluorescent lamp and bus fare equipment markets. The company plans to continue honoring warranties issued on products previously sold while disposing of its remaining stock. (2)	Corporate overview of LECIP INC.
(1) Company name LECIP INC. Note: LECIP CORPORATION is carrying out preliminary marketing activities and the like in preparation for the break into the US transport equipment market, but has not yet carried out any sales or production activities. Therefore, it has no assets to transfer to LECIP INC.
LECIP INC. is aiming to generate one billion yen in annual sales before its fourth year of operations, a figure which would have a negligible effect on the individual performance of LECIP CORPORATION. Because of our focus on our consolidated accounts and the fact that LECIP INC. will remain a nonconsolidated subsidiary for the foreseeable future, its performance will not affect the consolidated performance of the company. Once the sales of LECIP INC. increase to the point that they are significant in terms of our consolidated performance, LECIP CORPORATION plans to make LECIP INC. a consolidated subsidiary. Official name: LECIP U.S.A., INC.
Official name: LECIP (SHANGHAI) CO., LTD.